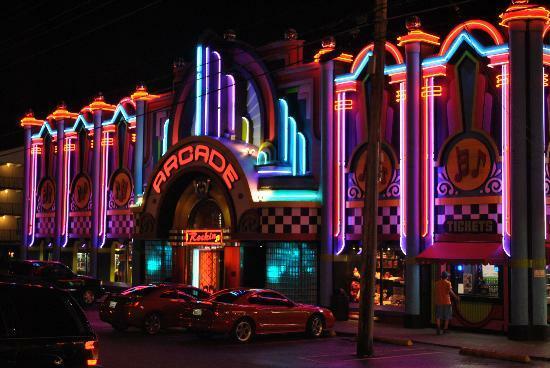 Enter through the doors of this Jukebox shaped arcade and into the exciting buzzes and flashing lights of the largest arcade in Pigeon Forge - Rockin' Raceway Arcade Pigeon Forge. With over 150 video arcade games for everyone in the group, the entire family is bound to enjoy a trip to this exciting arcade. Offering more than just arcade games, Rockin' Raceway Arcade Pigeon Forge gives guests the chance to drift like their favorite race car driver! If you've been looking for a Pigeon Forge go-karts slick track, Rockin' Raceway is the place for you! At Rockin' Raceway Arcade Pigeon Forge, the wide variety of gaming options allows guests of all ages to enjoy a day at the arcade. From young kids to kids at heart, there's something for everyone.Take a walk down memory lane with "Token Alley" where Rockin' Raceway Arcade Pigeon Forge houses a large collection of arcade games that take tokens just like when you where a kid. For the rest of the games, Rockin' Raceway uses an e-card system where tokens and ticket points are stored on a card, so there's no hauling around a bucket of coins and masses of tickets. Rockin' Raceway gives you bonus play when you put at least $20 on your card so you can enjoy even more fun times at the arcade. Additionally, once you register your card, you can save coins for your next visit. Whether you chose to play the Duck Dynasty Duck Hunter game with 90" HD screen, the latest multi-sensory zombie game, a fast-paced racing game, or an old favorite like ski ball, you'll be racking up the tickets points to redeem at the prize counter which features everything from Tootsie rolls to iPads. With name brands like Hello Kitty and Duck Dynasty for the kids and prizes from Coach, Craftsman, and Rubbermaid for the adults, the quality prizes featured at Rockin' Raceway Arcade Pigeon Forge provide an extra incentive to score high on the arcade games. Want a Pigeon Forge Go-Karts slick track to fuel your need for speed? Rockin' Raceway Arcade provides some of the fastest Pigeon Forge go-karts - in fact, if they went any faster, you'd have to sign a waiver and put on a helmet! This track differs from other Pigeon Forge go-kart racing tracks in that it is not elevated which allows for even more speed. Experience the thrill of drifting around curves like a NASCAR racing star. This five-minute Pigeon Forge go-kart racing ride will be the thrill of your vacation in the Smokies. Imagine yourself - hands behind the wheel, foot on the gas, and eyes fixed to the track as you take the final turn of this Pigeon Forge go-karts slick track. Let your inner Dale Earnhardt, Kurt Busch, or Jeff Gordon shine as you enjoy the fun provided by these Pigeon Forge go-karts. Take advantage of the Megadeal offered by Rockin' Raceway Arcade which gives you 3 rides and $10 dollars of play coins for $25! Pigeon Forge cabins that place you near Pigeon Forge go-kart racing fun! Cabins USA offers guests comfortable lodgings that place you in the heart of the action. Our Pigeon Forge vacation rental cabins give visitors to the Smokies quick and easy access to attractions such as Rockin' Raceway Arcade Pigeon Forge, Pigeon Forge laser tag, more Pigeon Forge go-karts, dinner shows and more! Come enjoy the vacation of a lifetime in the Smokies!